Nothing brightens up those last, dreary weeks of winter better than jumping the gun on spring by forcing bulbs to flower a few weeks early, indoors. If you want flowers in March when nobody else has them, here's how. But you have to think ahead! The process of forcing bulbs begins at least three months before you want them to bloom. Want indoor flowers in March? Do this activity in November. In the fall of the year, purchase the biggest tulip, hyacinth or other bulbs that you can, from a garden catalog or a local store. The bigger the bulb, the more likely your project will have success. You'll get a more attractive display if you cram the bulbs close together . . .
then cover with a light, one-inch layer of soft potting soil. Keep the bulbs cool, perhaps in a garage or unheated basement, or if you happen to have an extra refrigerator, that works great. You don't want them exposed to air for very many days, for they'll dry out. The idea is to keep the bulbs in a spot that's cooler than your house, but warmer than the outside, to encourage roots to start growing. You can dig a simple trench outside in an area that's protected from the wind, to keep the bulbs in, and promote growth during the late fall and early winter. 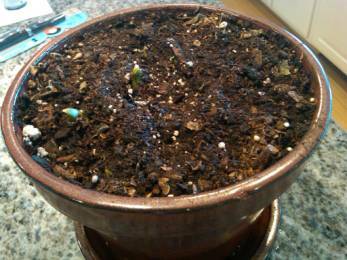 Make sure the soil below the bulbs is loose and pulverized, or broken up. Cover with about an inch of soil. Mark with stakes so you'll remember where they are! Water well. If it's a dry winter, you might water your trench area once a month or so, just to make sure moisture is getting to the bulbs. Then dig them up in late winter, when you're ready to pot them, a few weeks before you want to see blooms. Or . . . you can put the bulbs in the pot right away, and then keep the pot in a cool place, ideally a garage or extra refrigerator. It takes about 12 weeks to develop roots and start the growing process for the part of the plant that's over-the-top of the soil line. To plant bulbs for forcing, make sure the soil is really loose to encourage root growth. Place the bulbs fairly high in the pot, with the flat side down and the pointy side up. The tips should be only about an inch below the pot top. Water in well, so that water drips out the bottom. Then keep at 48 degrees or cooler. Now wait 12 weeks, or maybe a week or two longer. To check root growth, carefully spoon up one bulb and see if you have an inch or more of root growth. If so, replace it and bring the whole pot in. If not, put back in the cool place for a while longer. It's exciting to see the first shoots pop up . . . When root growth is good, transfer the pot indoors to a cool, dark spot in your home for a few days. Keep the pot evenly moist but not drenched. Then bring the pot to a place that's still cool, but has some light. When the shoots are a couple of inches tall, move the pot to the warmest, brightest, sunniest window in your house. And enjoy the show! Note: some people say that once bulbs have been forced, they've expended their energy and have to be thrown away. 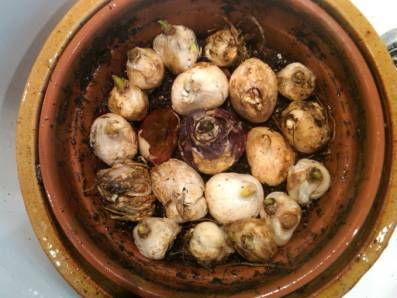 Others say that, after the flowers have faded, you can transplant the bulbs and leaves into the outside garden. Plant them at the same depth they were growing in the pot, and, some say, they will rebuild their strength from the sunshine and rebloom outside next year. Do not cut off the foliage until it's dead and brown; every bit of the green leaves are needed to rebuild strength for next year. GRAVEL METHOD: If you have a pretty, ceramic bowl, it's fun to force fragrant, colorful hyacinths in it as a centerpiece in your home. Simply fill the bowl with gravel almost to the top. Push bulbs on the gravel as close together as you can, with the flat side down and the pointy side up. Fill the bowl with water just to the base of the bulbs. Keep the water level at that level 'til roots start to appear. It should take about two weeks. As the hyacinths blossom, you can freshen the water every week, and throw the bulbs away afterwards.